Why are we offering full IT services? The first reason is because you have asked us to. We have already installed some of your network equipment like Gigabit switches and routers and have also done your computer cabling. One thing we have learned by being a member of the national organization TAG (Technology Assurance Group) is that Managed IT Services and Cloud based solutions are growing across the country. Break Fix solutions don't work for customers because they are reactive – not proactive. What's the difference? With Managed IT Services your computers and operations are being checked daily for problems. Updates are done without interruptions. The service includes all Antivirus software. We run software to identify any problems before we start and address those issues. We do this every 3 months, meet with you to go over the reports, and help you plan your IT around your business goals. 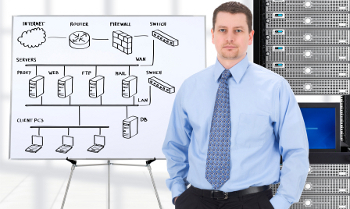 Let us improve the performance of your IT networks. Our help desk is available 24/7 with a live person – no voice mail. Assistance is just a phone call away. When you call your IT person now you are likely connected to his cell phone voice mail. What if you have an urgent issue that has stopped you from doing your job. Our help desk takes your call and works the problem to get you up and working again. You can also start a chat from your computer to resolve problems and if needed the help desk will dispatch a tech to your site. Backing up your data is critical now. Most of you have drives with labels for each day of the week. You are responsible for switching them out each night and taking the last one home in case of a fire. We put an appliance on site that backs up all your data and also backs up to the data center in the cloud (Remote Site). We check to make sure both back up's were 100% and the problem is addressed if not. Don't let a system failure shut down your business. Let us protect your valuable data. We find that a lot of IT companies do not understand VoIP. They do not set up your networks correctly for today's phone systems and the features that customers want to grow their business and reduce operating cost. This is what we do. Now you have one company that can take care of your Voice, Data, Video, and Cabling and help you with getting the best internet available for your location. IP cameras for Video surveillance now run on your network. We can set up an IP Video System that works for what you need to see. Let us help you put your IT budget to better use. We will meet on a quarterly basis to make sure your IT is going the same direction your business is going. Our proactive approach improves your productivity so call us today at (520) 547-9621 and leave your IT troubles to us – so you can get back to doing what you do best. Don't Be Reactive Go Proactive Today!